THPBlog: Campbell Timberlands to log on steep and unstable slopes NW of Leggett, CA. Campbell Timberlands to log on steep and unstable slopes NW of Leggett, CA. This THP is about 4 miles NW of the town of Leggett, CA and Highway 101 at an elevation of 960 to 1,960 feet. Campbell Timberlands is planning a tractor and cable logging operation on steep and unstable slopes in redwood and Douglas fir forests. 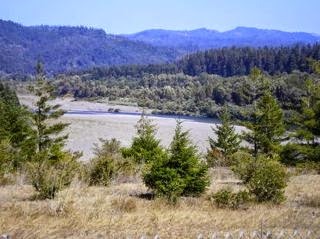 The THP area is inland and drains into the South Fork of the Eel River which is listed as impaired for sediment and temperature. There are 3 landslide terrain areas including 2 historic road failure sites and a moderate hillslope failure. Campbell Timberlands is planning ground based operations at 2 locations inside unit C on steep slopes over 50% grade with a high erosion hazard rating, and on steep slopes over 65% grade in unit C for yarding and site prep. They also are planning to use tractors on unstable slopes within units C and D. 27 road drainage sites are planned for work including rocking, dip construction, ditch cleaning and culvert repair and replacement. Spotted owl nesting and roosting habitat is deficient within .7 mi for spotted owl site MEN0527. This THP will remove 21 acres of foraging habitat within .7 mi. More information is available on the THP Tracking Center website.